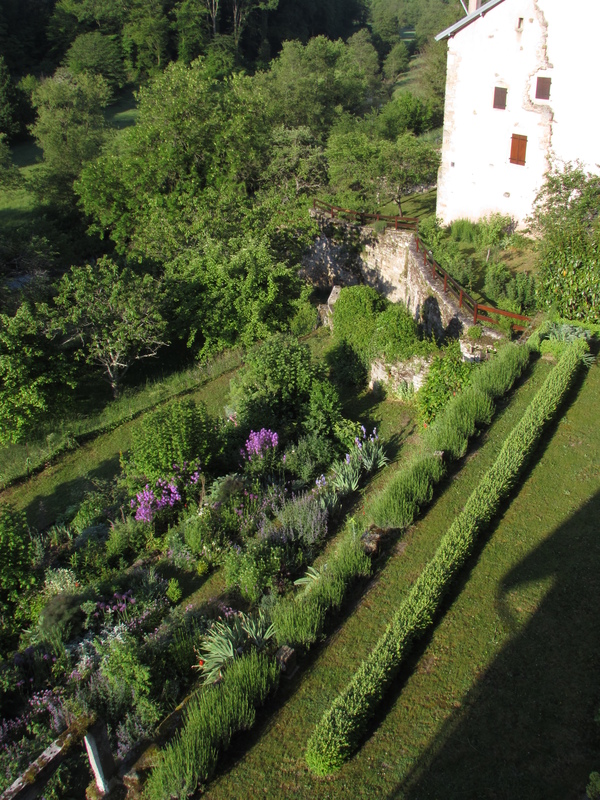 The Rose Walk looks great from up on our guest bedroom balcony, and gets better the closer you move. But I’m really finding it terribly difficult to photograph. 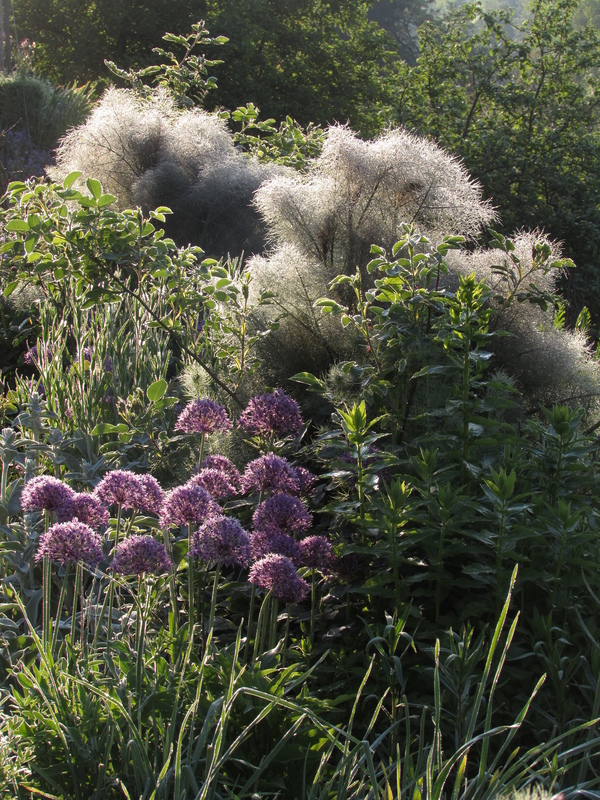 It’s so pretty at the moment with its fennel, alliums, irises and Nepeta ‘Six Hills Giant’, but doing it justice seems almost impossible due to the light and the fact that if you photograph it early in the morning your shadow falls across it. It’s literally a long, narrow little pathway where the roses actually move up to meet your nose so that you can appreciate them at first hand. 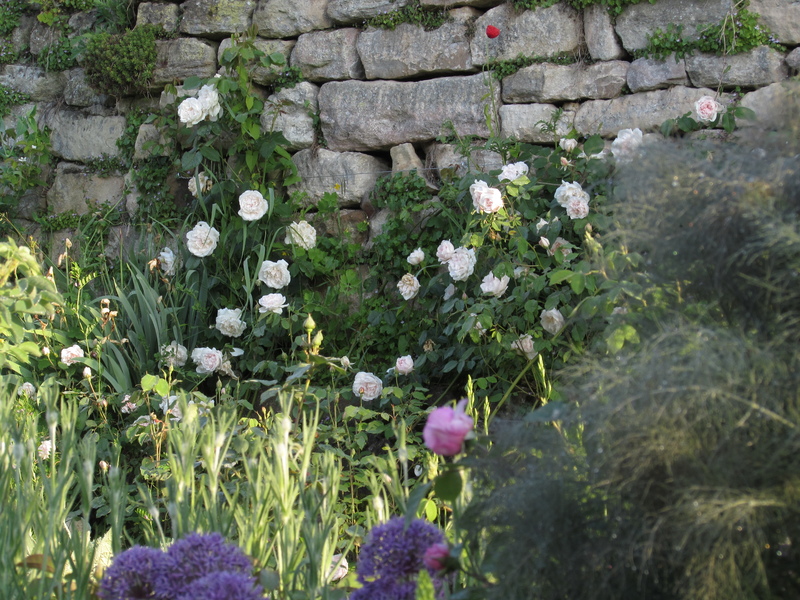 The roses don’t seem to be bothered by much black spot, in spite of the close planting. Funnily enough it’s free-standing, less cramped roses elsewhere also show signs by now. 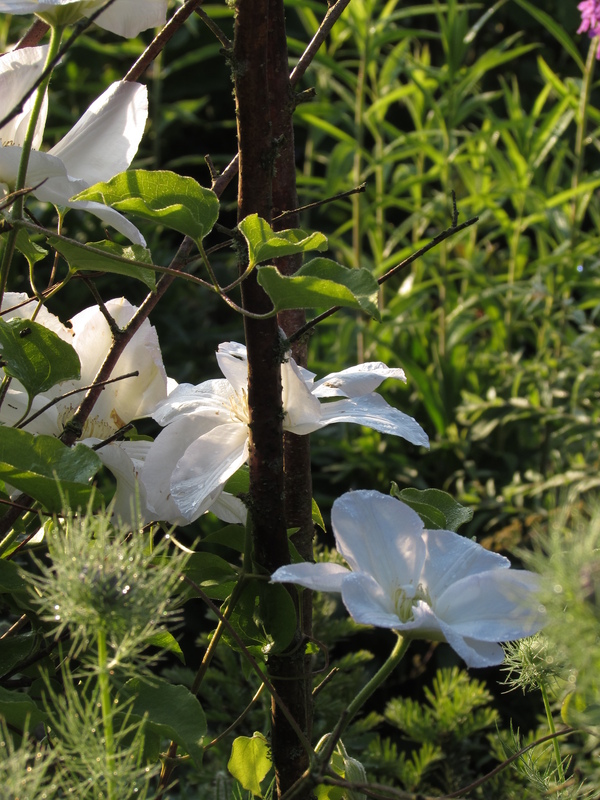 The poor white clematis on the tripod in the picture above has, sadly, succumbed to the wilt. I don’t know its name, but I’m glad I captured it before the end. It was in the garden when we first arrived in September 2011, and seems to do this every year, then manage to revive itself. I wonder if it needs firmer support (bit like me!)? Perhaps it wobbles too much in the wind? 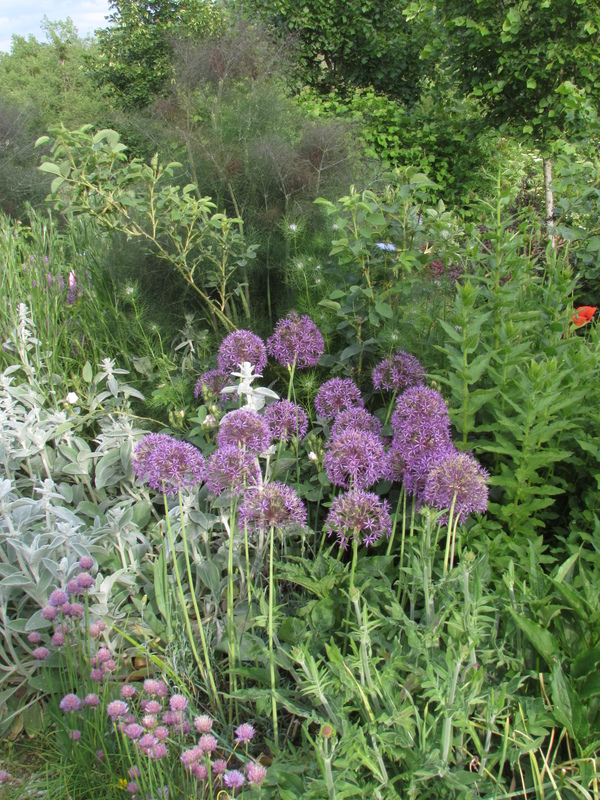 The borders are busting with alliums – can’t resist them and will continue to add to the collection – probably A. christophii next year. 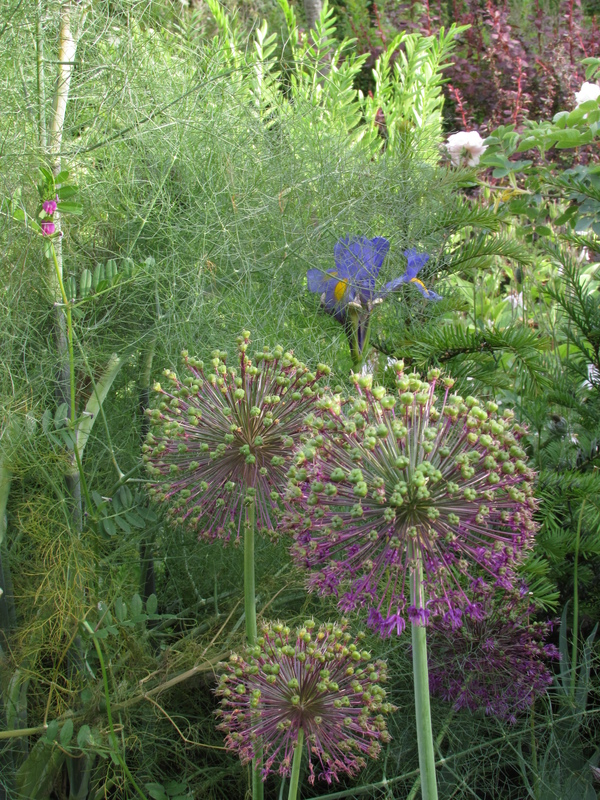 They look so good with the bronze fennel and the colours of the two together are just about my favourite garden combo. Here with Iris ‘Gypsy Beauty’ – the Dutch iris are really useful in a border. Don’t get in the way, just suddenly surprise you by popping up and pleasing when you want them. 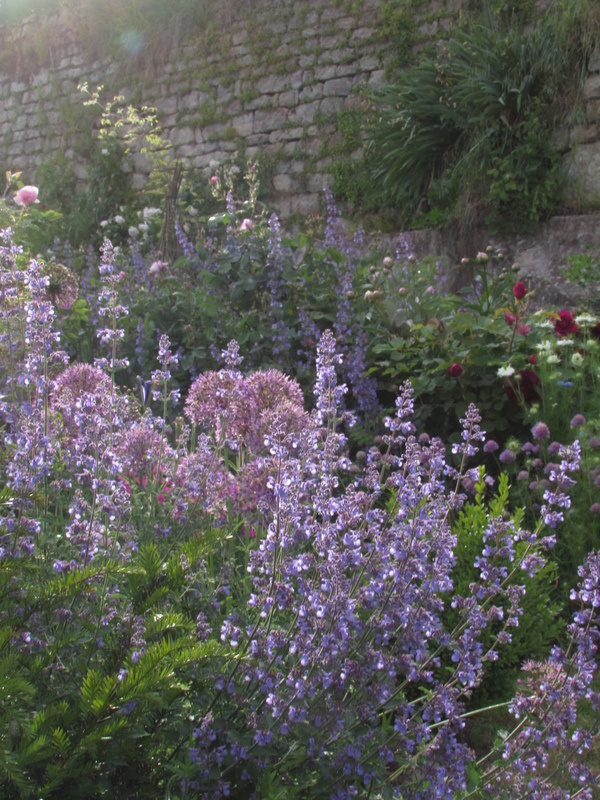 Early morning is when Rose Walk looks most like my dream border – but, as I’ve said, it’s also harder to photograph without capturing your own shadow nicely. 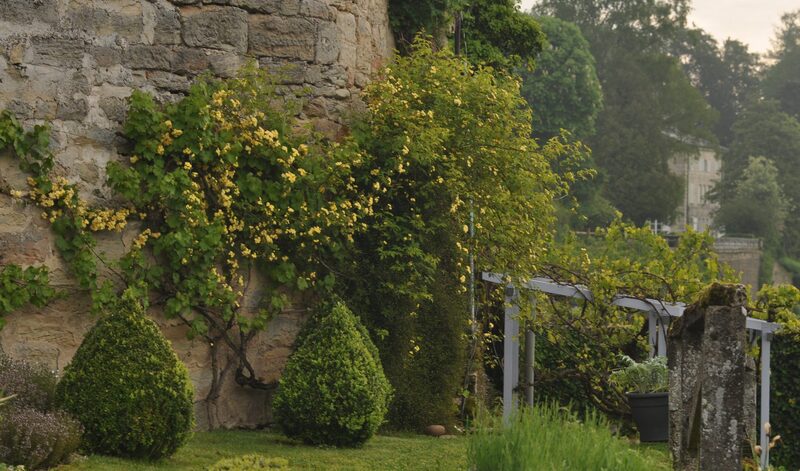 The roses in the Rose Walk are just getting into their stride, although elsewhere, against walls, they have been flowering for some time. But I thought I’d share two. 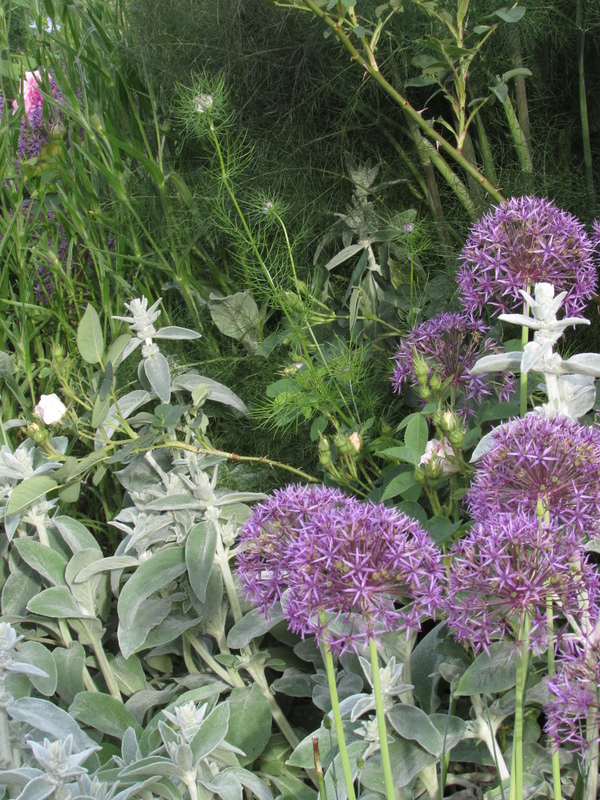 ‘Munstead Wood’ is constantly the most reliable, longest flowering, most beautiful I grow. 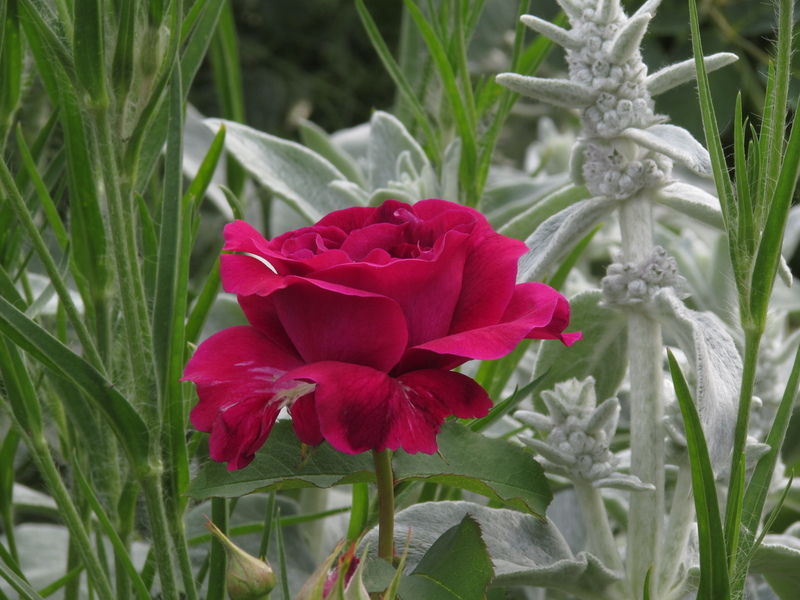 Are you growing a rose that wins hands down on beauty and reliability? Last year I added ‘William Shakespeare’ and couldn’t tell the difference between it and MW. 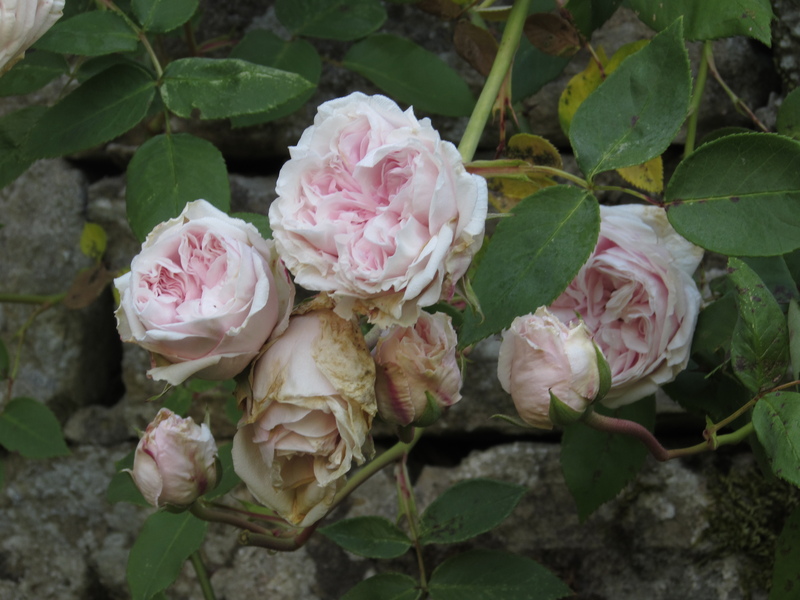 Now I can and ‘Munstead Wood’ remains my favourite (they are both David Austin roses). 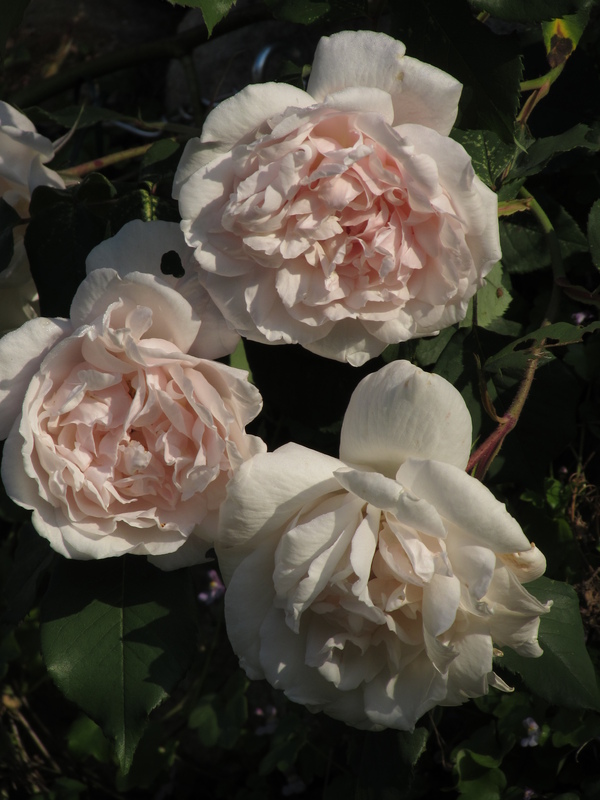 In the Iris Garden there are two roses flowering at the moment. 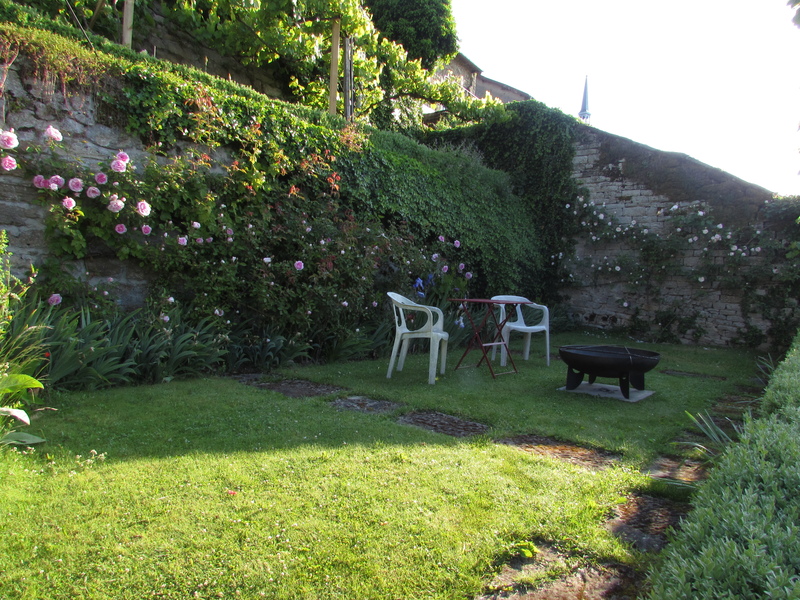 This picture is of the garden before we added our lovely new table and celebrated with some friends last Sunday night. 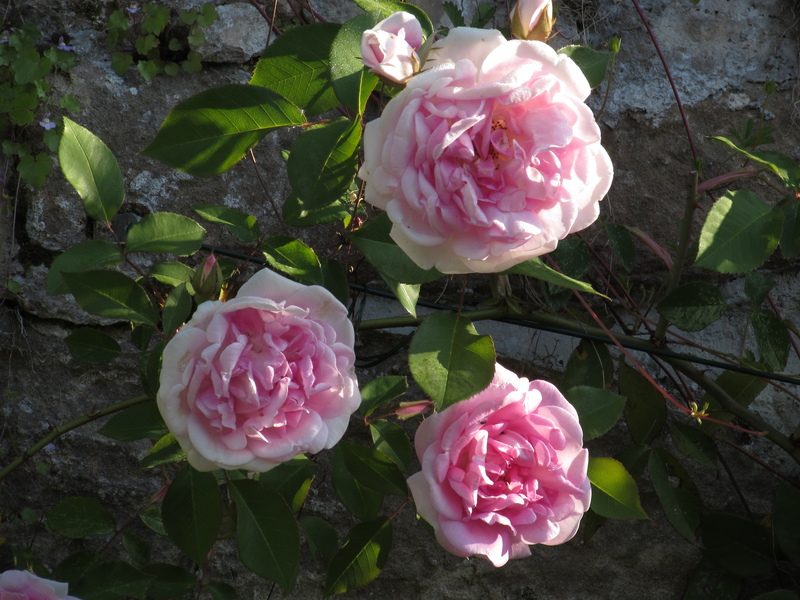 On the end wall, the shorter of the two, is ‘Souvenir de la Malmaison’, one of my favourites for the perfect quartering, but showing in my picture that she didn’t really like the wet weather we had at the beginning of May. The flowers are doing that annoying ‘balling’ thing. I think you have to learn a rose’s character before you know how to prune and train it against a wall. I haven’t quite got there with ‘Souvenir’, but I seem to have managed it with ‘Blairii No. 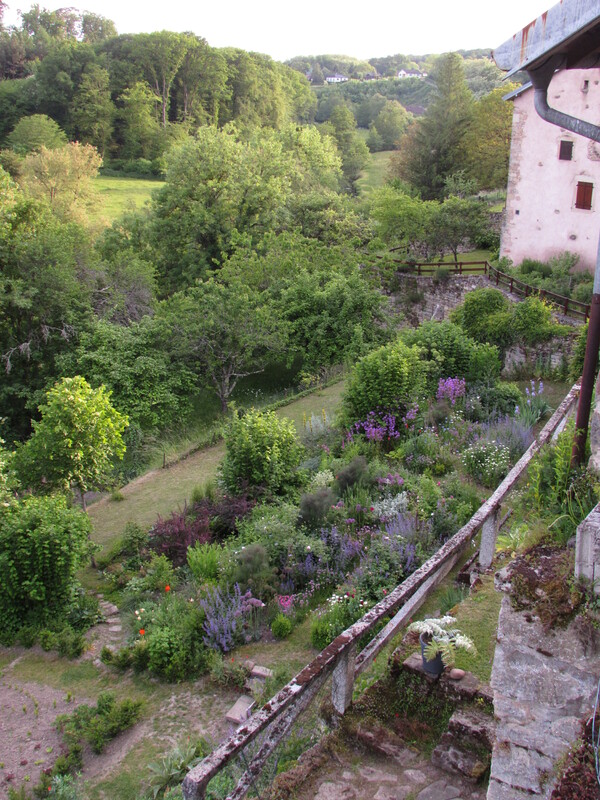 2’, flowering on the longer wall behind the two chairs. 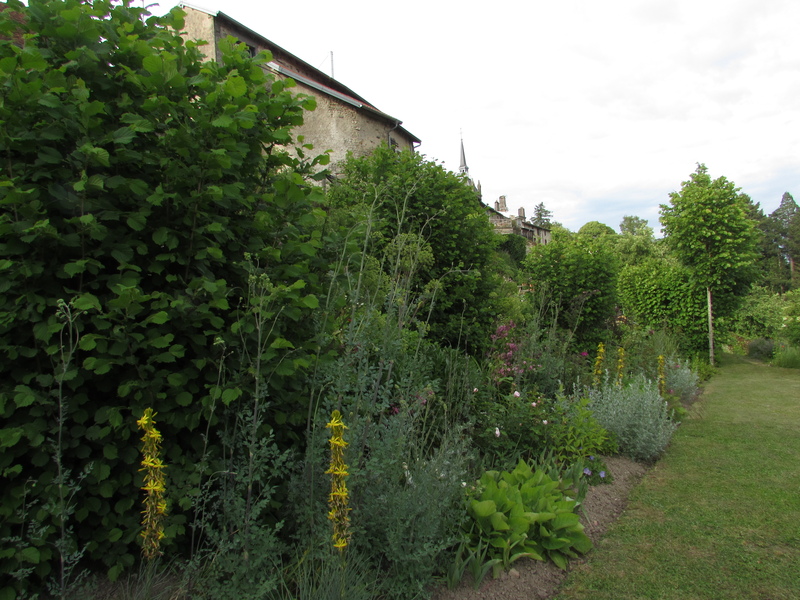 I’ve moved down from the Rose Walk to what we called the Long Border. 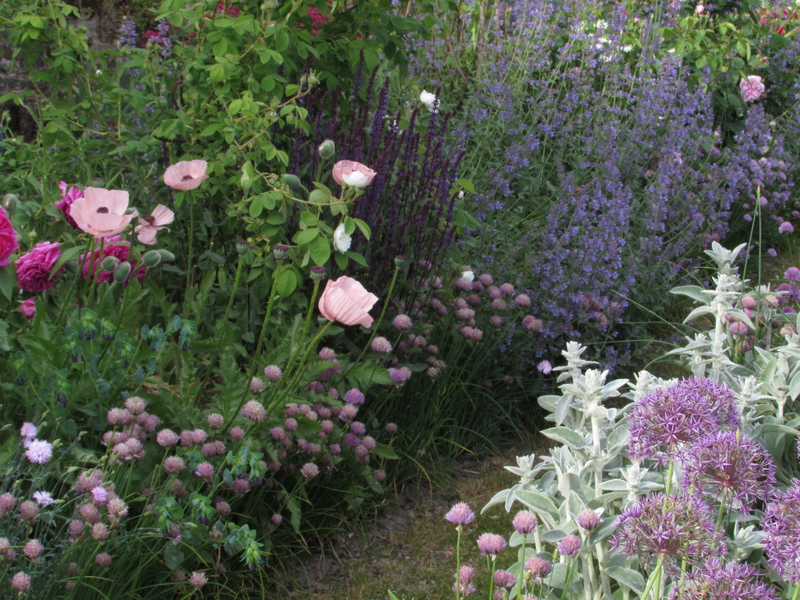 It has to act as a bit of a backdrop for the Rose Walk and really aggressive things that look good with the roses, but are too big in bed with them, are allowed to self-seed down here. 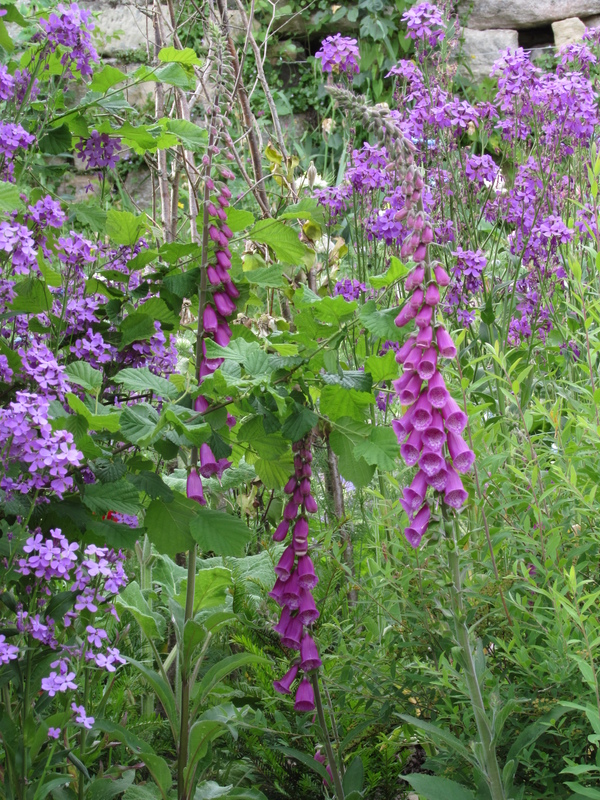 For instance the Dame’s Violet or Hesperis matronalis. 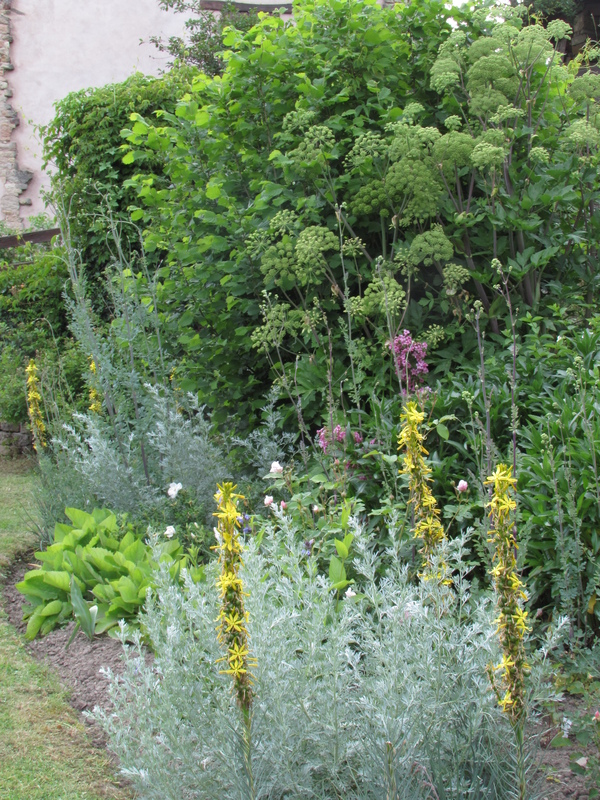 This border really started life in 2013 as a nursery ground for plants I’d raised from seed, but now I’m starting to ask it to get on with it’s real life’s work – a later flowering herbaceous/shrub border. 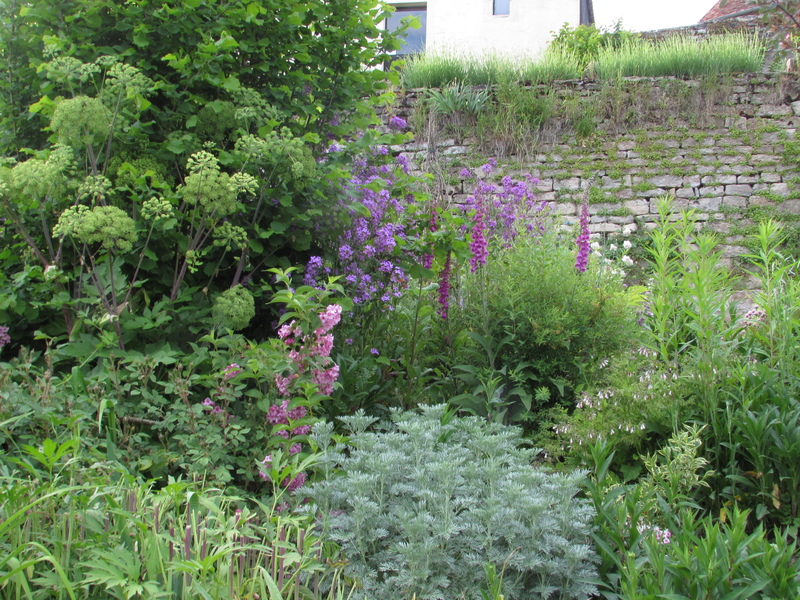 This year a few heleniums, monarda and grasses have been added and I’ll build on that. 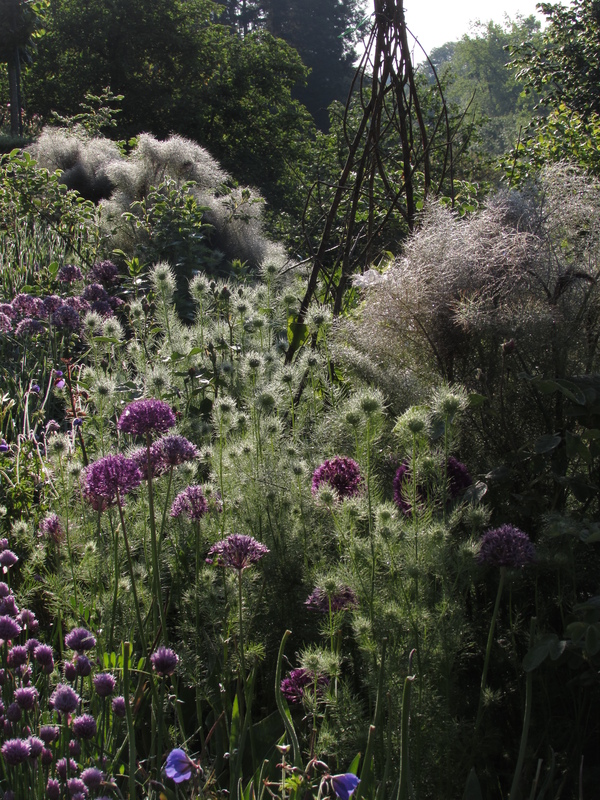 I’m heavily into giant plants and really enjoying the effect that these Angelica sylvestris that I grew from seed are having as they tower up around the hazels. What I’m not enjoying so much is the yellow of Asphodeline lutea with the pink of the young weigelas, scheduled to move elsewhere in the garden. 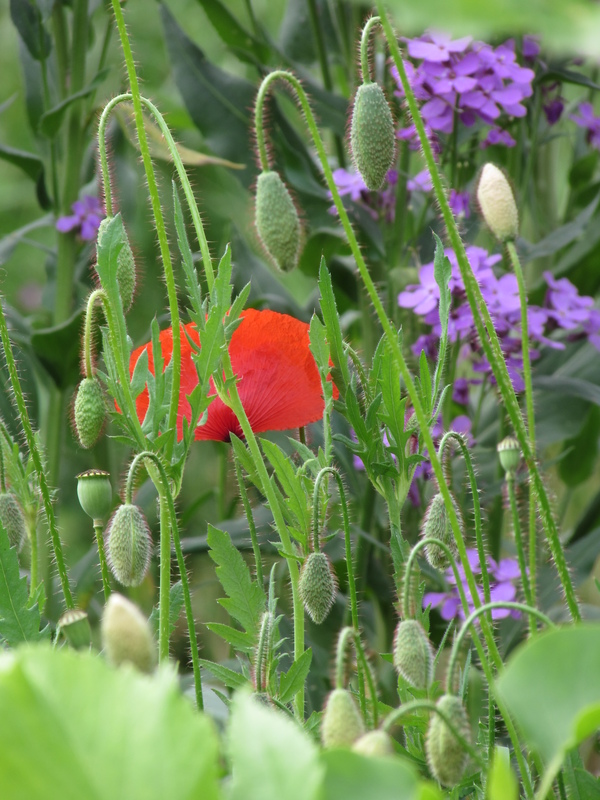 The poppies are allowed in here, although I’m managing to get tougher in the Rose Walk. 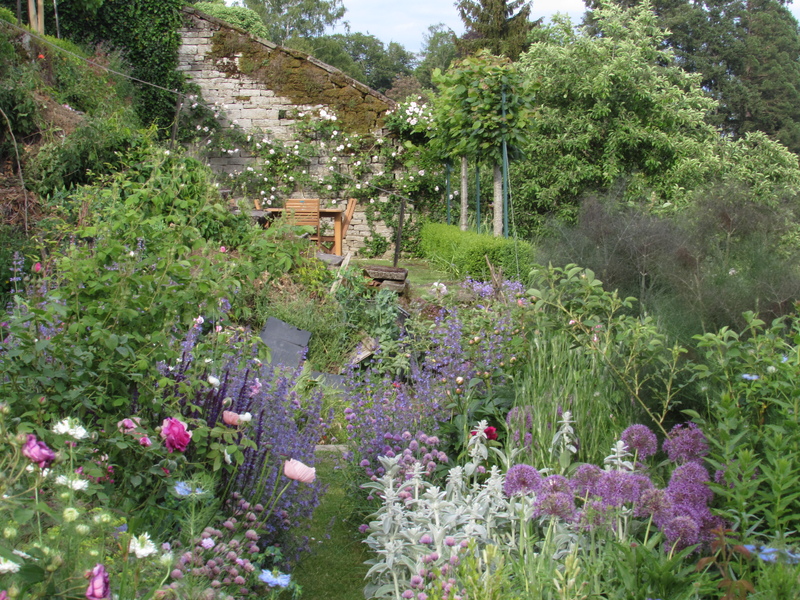 And I seem to be having great success with Agrostemma githago, here photographed in the Rose Walk, but I’d quite like it to leap over into the Long Border and get on with it there as well. 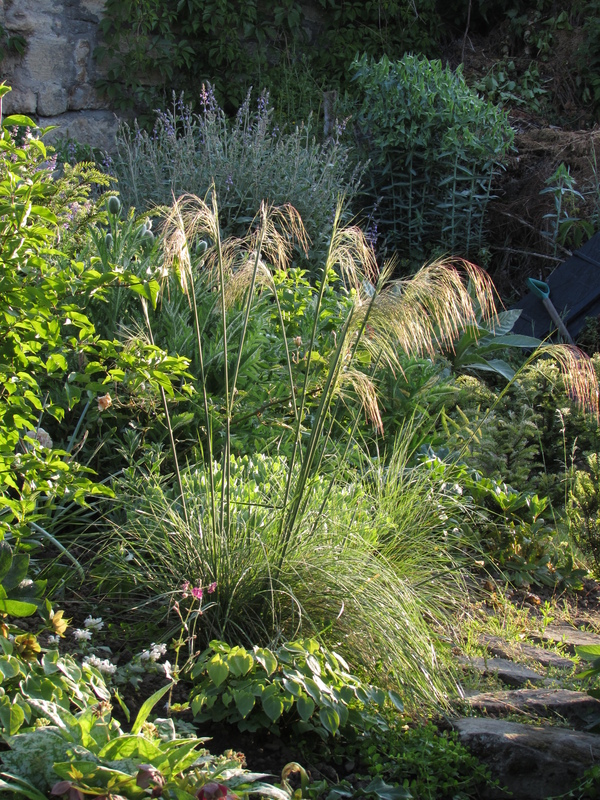 It’s the first flowering for one of my grass favourites, also grown from seed, Stipa gigantea. 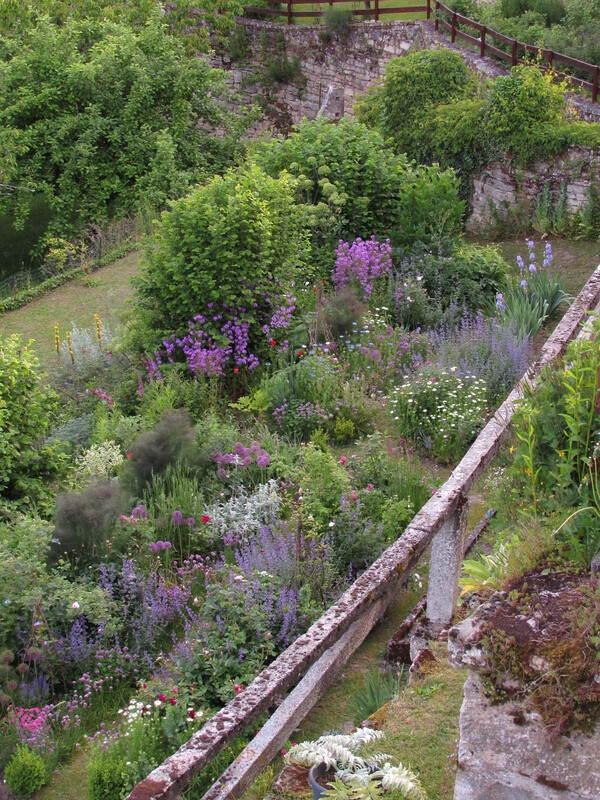 I can look over the edge of the Long Border down at the Hornbeam Gardens. They may look like nothing, but I’m pretty excited. 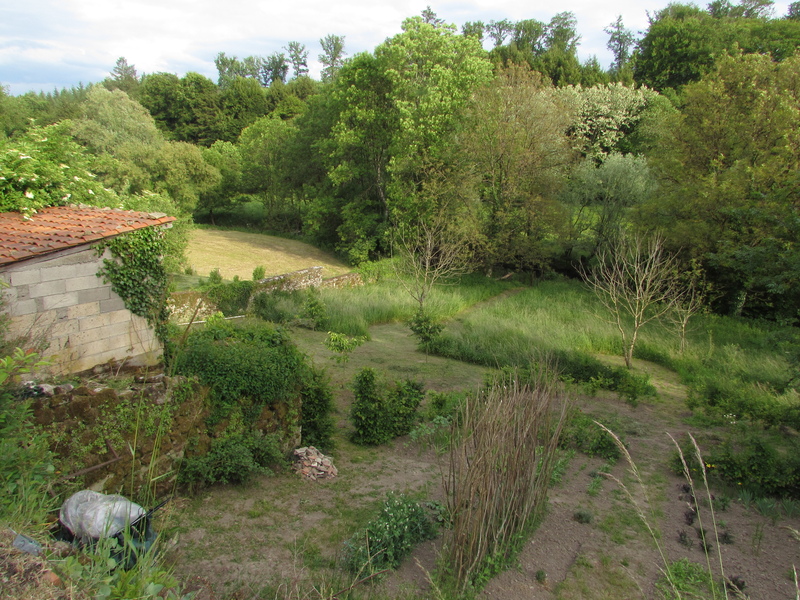 There was no garden here before – et voila! 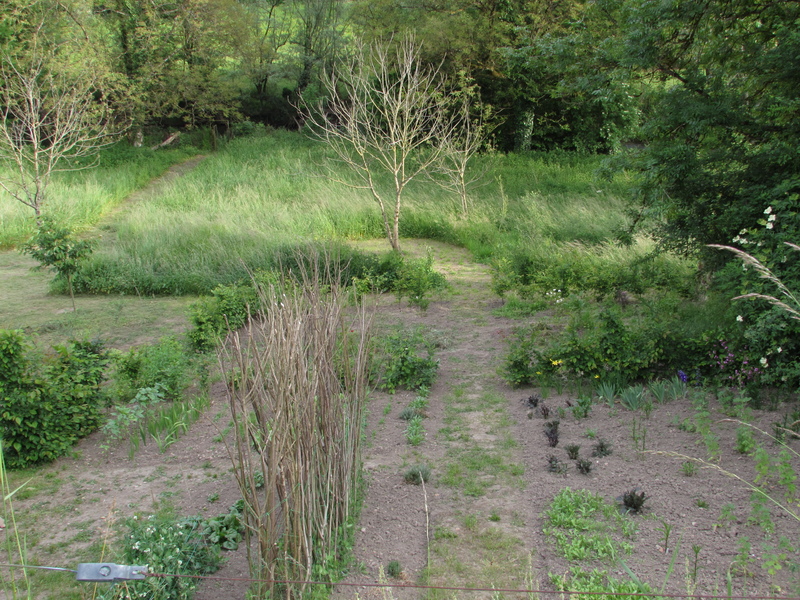 To the right of the scruffy path I have dahlias (dark purple foliage in the pictures) coming up in front of the delphiniums and asters. 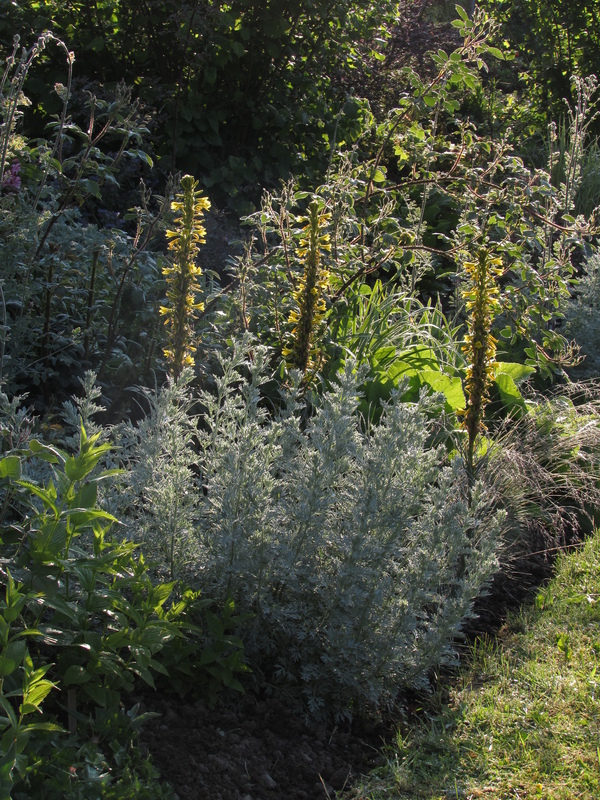 At the top of the dahlia edging there’s a random mix of calendula, Salvia hormium and nigella which seems to be doing well – and could look very pretty. 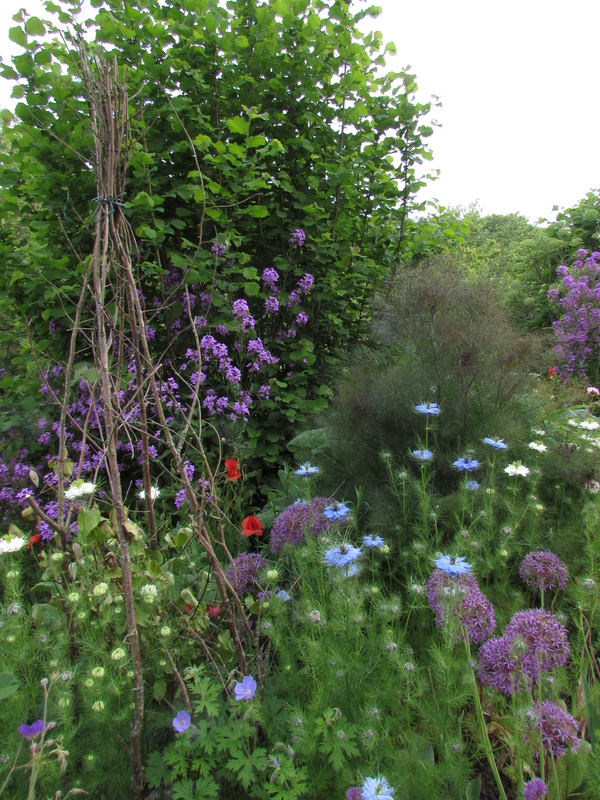 To the left, the sweet peas are the best I’ve had here and the cut flowers (aside from one sunflower variety planted too close to the hornbeam hedge) are doing well. I didn’t get any germination from some Hardy Plant Society seed of Ammi majus, but fortunately the Ammi visnaga are doing well. 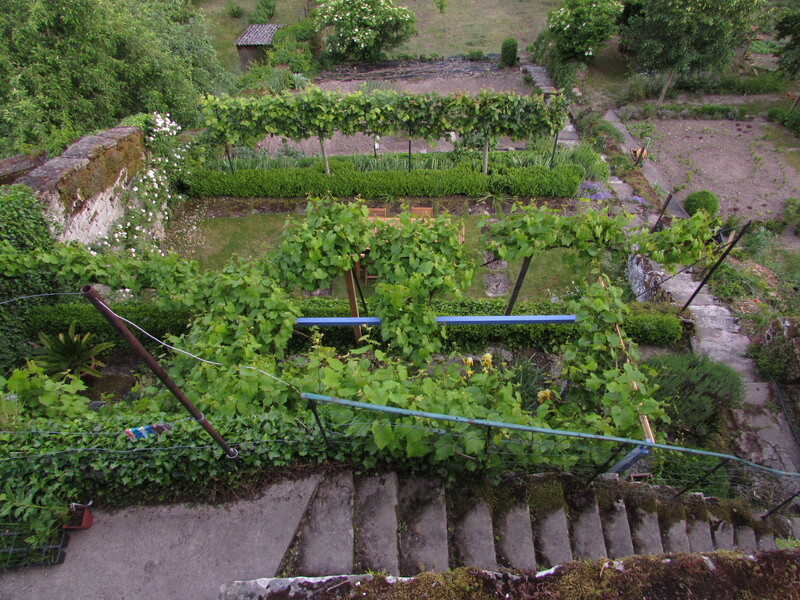 Evening drawing on and the garden still looks neat and tidy when I look over from the top down at the lovely new, blue pergola Nick is slowly creating. 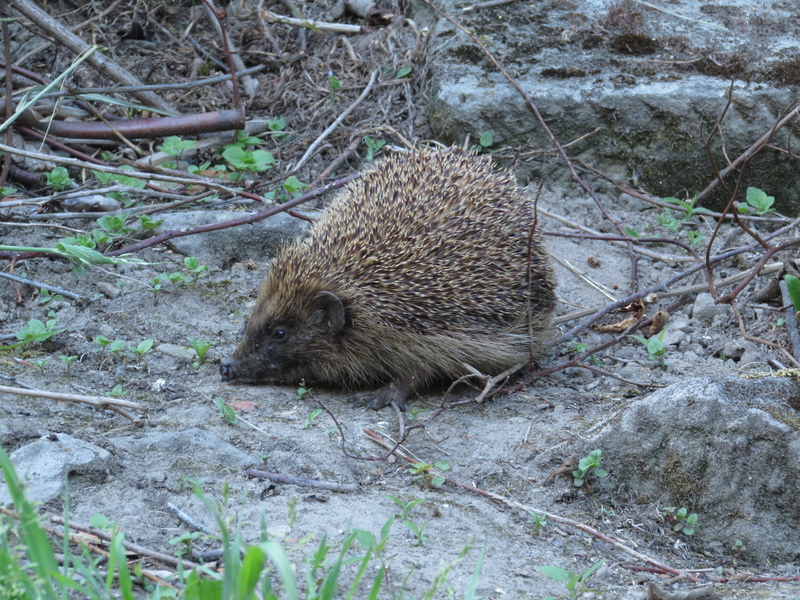 And he’ll be surprised to see that I’ve added the photo he took of his friend scurrying around at dusk. 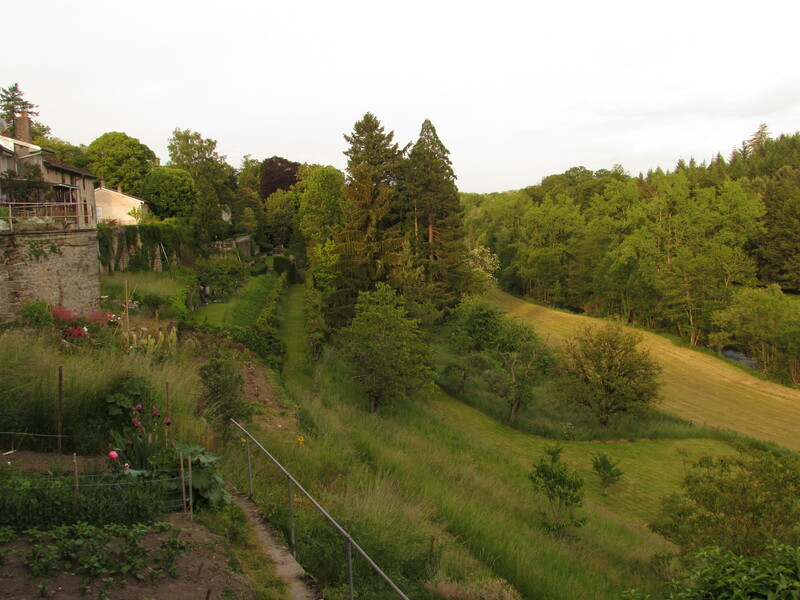 And, finally, a longshot of the whole valley and the chateau grounds looking tranquil in the evening light. 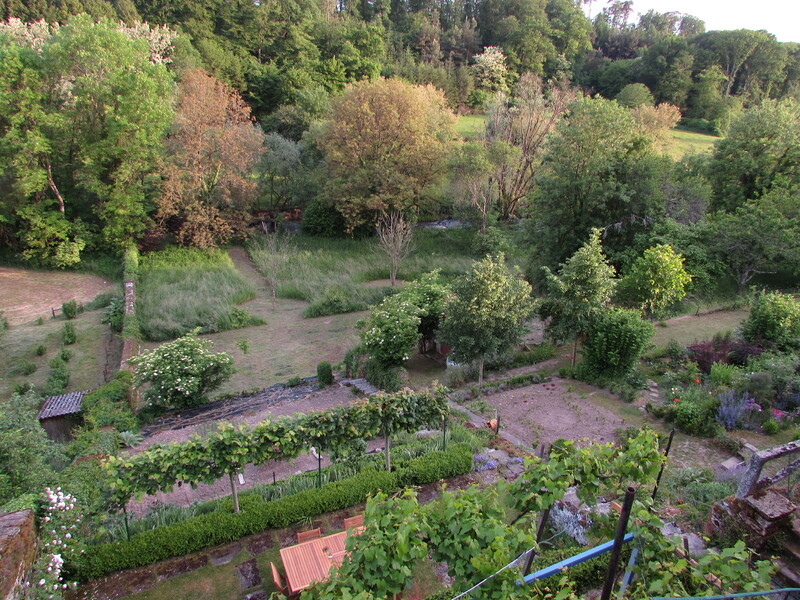 Yes, the garden definitely looks better with a glass of wine in the hand, rather than a fork (for a change). 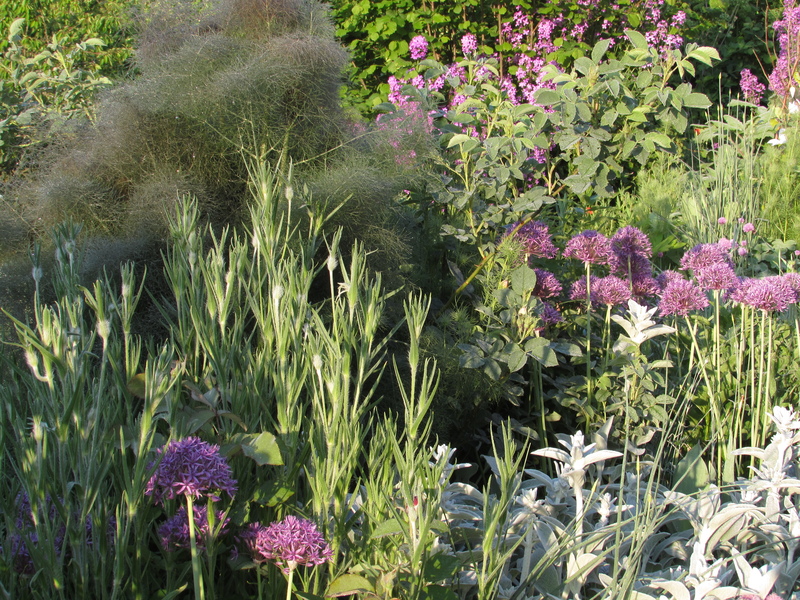 I’m using this post as my effort for Helen’s ‘End of month meme’ at the Patient Gardener’s Weblog. Do nip over and have a look at what everyone else is doing when she posts on Sunday. 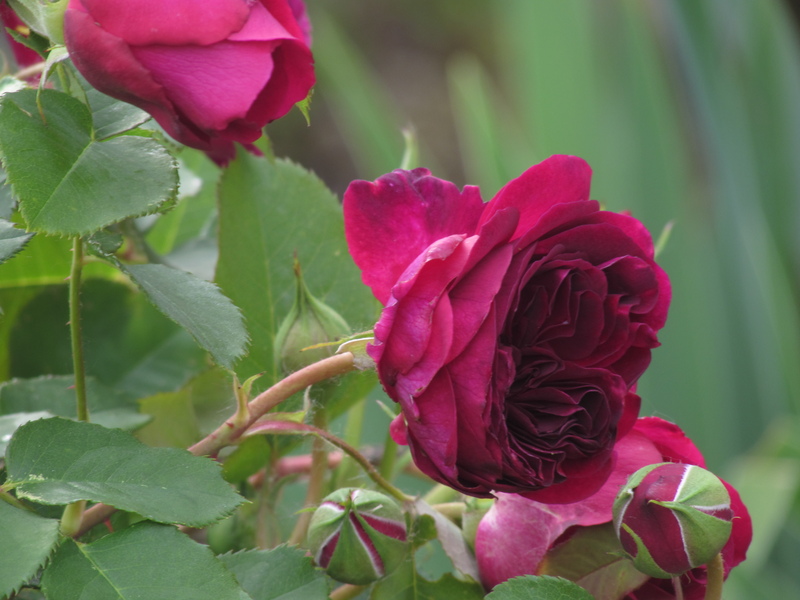 This entry was posted in End of month meme, Good things this week, Roses and tagged Rose Walk, Roses on May 29, 2015 by Cathy.